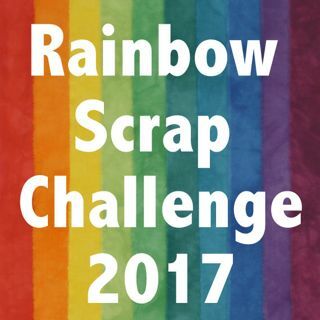 Last week I made a post about all my UFO's related to the Rainbow Scrap Challenge. I kind of got doing the RSC in late 2012 because I wanted a project to kick start me. Well it did. Before that I was having a very long quilting slump. I was having trouble finding the joy in quilting for me. Also know I machine quilt for other and have been for 15 years now. I had made many art quilts and traditional quilts that were good enough to send to large National quilt shows. I had been apart of a small art quilt group that did a new themed show each year and sent to many galleries in Western Canada, I needed to do six to ten good art quilts each year. I had done some teaching at a local shop and then was doing some travel teaching as well. I think I lost some goals. You know "been there done that" feeling. Why did I quilt? I do not need more quilts in the house, really. I have not had much luck selling them. Well the RSC helped me find the joy, I would find a little block or two to work on here and there. The colour I worked on was picked for me at Soscrappy. I could try out a block and not make something big. I was not needing to buy more fabric. I was using the scraps. I could play with a little block pattern and not make a big commitment. I had fun playing in my stash and sorting out the little bits of fabric. It really helped me to get back to patch work for fun. I show you Bouncy Ball because I was so inspired by the RSC I could not stop and made the whole quilt in just a few weeks. I just went ahead and did a few extra colours and I quickly had a top done. Then I wanted it quilt it right away. Done. Bouncy Ball on the agility equipment. The block looks like a Hollie Roller that I use to help train my dog at agility. I tell you all about this because I see a few friends and internet buddies that are saying they are in a slump. We never know how long it will last. We do not know how or when it will happen to any of us. I know I have had little slumps before, in part from some kind of lose or sadness. Like when my grandmother died. It only lasted a few months so no big deal. But for a slump to take more then a year, maybe two years. Och. And to not know why or what triggered the slump did not help. I know some are in a forced slump like losing your sewing space to family moving in or needing to take care of someone sick. But they will be back as soon as they can. Making my list last week helped me get back to work on the RSC. 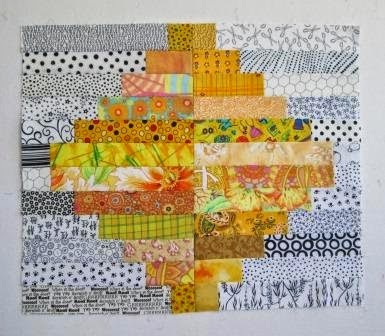 I have had a very busy spring and was not getting my patchwork done. I got behind on a few blocks and colours. I was not sure where I was at. 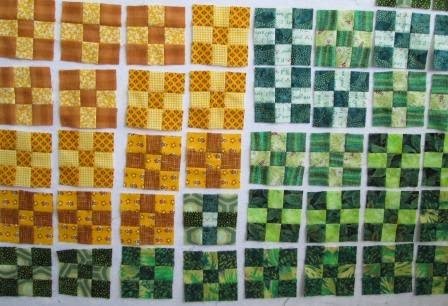 I am hopping to finish a few quilts this year. I have loved having a block or two to do each week, but someday I will have to get to the larger job of sewing the blocks together. So this weeks RSC2014 blocks. My yellow spool, in the correct size of 8". Yellow and Green nine patches. I did not get the green ones done last month. These are 3 1/2" square. The whole wall at once. Not too bad for a week of colour. 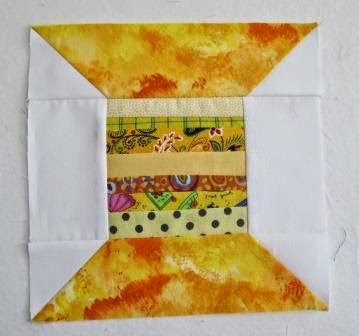 You can go see what others are doing in Yellow this week by checking out the linky page at Soscrappy. I can so relate to having a slump Cathy- after our son moved to the east coast I did not want to go upstairs and quilt- that was his space in the house and it made me miss him more. I have been quilting some this winter but will soon hit my quilting high season - Summer time is the time for me as school will soon break for vacation. I have lots of projects in my head and two wedding quilts to finish. Tomorrow's goal - the label on a quilt for a friend who is retiring. I absolutely love your bouncy ball quilt! The offset rows leave such nice white spaces. 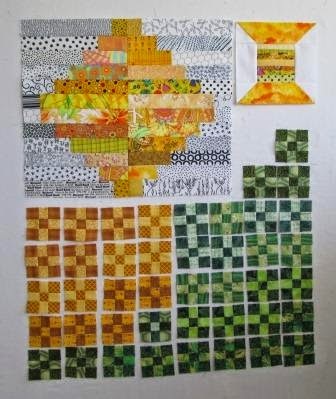 It is so wonderful to hear that the rainbow scrap challenge has helped bring joy back to your quilting. So many wonderful blocks have come out of your play time. I'm so glad you have found joy in your passion again. I just loved your post! I did not realize you were in a quilting slump for a couple of years. So glad the RSC was able to have you realize it is fun to play with the sewing machine again. Love the color variation of the nine patches. Slumps are no fun! It's good to hear that RSC has helped to lift you from yours. Your yellow lantern is wonderful. Using the black(or are they grey) and white prints with the yellow really makes the block sing. I didn't realize the correct size for a spool block was 8 ". I kind of made up my own version that will finish at 4". I didn't have a pattern but thought I could figure it out. They didn't turn out too badly. I'll post my smaller spools next week. You have such a lovely collection of yellows in your blocks. They warm the heart. 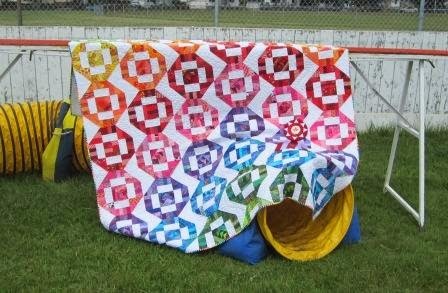 It was fun to see the Bouncy Ball quilt again! Your RSC blocks are lookin' good - glad your inspiration has returned! Saved by the RSC - a quilter is a terrible thing to waste. I think it's the color part of the challenge. How many would actually make a yellow block if left to their own color ways? I like yellow, red, orange, green, well, blue and purple as well. It's the browns and greys that bring me down. I am so glad that you found your mojo and returned to quilting when you did. You are very talented and very artistic. Sometimes we just need to do things for fun and for ourselves. Now that I have a long arm people always ask if I am going to quilt for others and for a fee. I honestly do not want to do that because I worry that my fun and stress reliever would eventually become a chore and an obligation. Great blocks. You have done so many quilt projects. I think the RSC keeps me going strong. 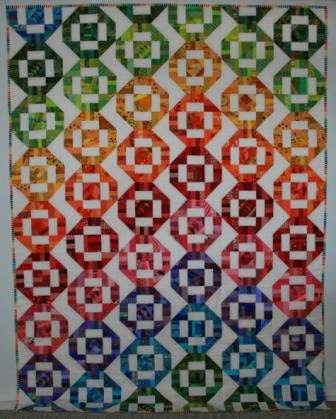 Results are some very colorful quilts that are wonderful for gifts and charity.